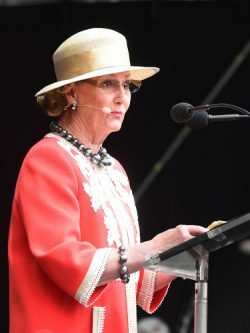 She went on to hold the opening address at the 65th Festspillene, with King Harald in attendance as well. Security was higher than usual, following the terrorist attack in Manchester on Monday. Streets leading into Bergen’s main city square Torgallmenningen were blocked by historic fire trucks, to prevent anyone from driving other vehicles into crowds of people. The opening ceremonies included highlights from the festival program, with the Bergen Philharmonic Orchestra playing as well. The festival runs until June 7, with the full program in English available here (external link, to the festival’s website).